Do you love warm, rich tones of red and burgundy paired with neutrals and gold? Yes? Well, this wedding right here is going to be right down your wedding alley. Think geometric patterns, a hint of rustic romance, and ambient lighting with a touch of boho flair for an industrial vibe that completely ties each and every detail flawlessly. Take a peek at all the pretty in this gallery captured by From The Hip Photo below. From The Hip Photo…Located in the River North Art District in downtown Denver, Colorado sits Blanc, the perfect setting for Emilie and Tom’s dream wedding. RiNo is home to downtown’s awesome art scene, a cool mix of urban living, art and industrial buildings. Emilie and Tom’s magnetic personalities feel right at home with Blanc’s beautiful decor. From the glass garage doors, metal flower wreaths, barn doors, and brick walls- the industrial vibe really helps the beautiful maroon and navy decor and florals from Plum Sage pop! Emilie stunned in her Nellie Lace Gown from Dreamers and Lovers and matching veil with her astounding rose gold, pear-shaped sunburst halo diamond engagement ring. Tom looked incredibly handsome in his navy suit and maroon polka dot tie, his groomsmen matching, but with different color suits, made this wedding stand out! Her bridesmaids look amazing in their floor-length, high neck, maroon dresses and autumn inspired bouquets with navy velvet ribbons. 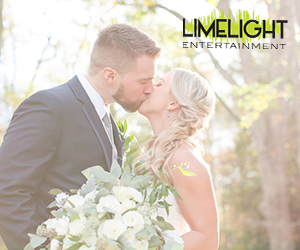 Their ceremony and reception were filled with so much love and laughter. Emilie walked down the aisle to violinists playing in the background and walked back down married to her best friend, Tom. The reception boasted long rustic tables, maroon napkins, and vintage looking amber-colored glasses and a mixture of candles, succulents, and flowers strewn across the tables. Their dessert table was covered with mini cupcakes, tartlets, rice krispies housed in wooden geometric shapes and the perfect buttercream cake for the couple to cut into. The night was highlighted by toasts and incredible dancing and of course the love that Emilie and Tom share with each other and of course for the friends, family and loved ones that shared their special day that stared the rest of their lives together as husband and wife.